Mathematical artist, Mike Naylor juggling 5 balls. Since Justin introduced mathematical poetry last week, check out one of Mike’s mathematical poems called “Decision Tree.” What a clever idea! Like Mike, I’m a juggler, so I absolutely loved his Fractal Juggler animation, which shows a juggler juggling jugglers juggling jugglers… Clever idea #2! And for a third clever idea, check out the Knight Maze he designed. Wow! The most squares of whole area that will fit in a square of area 17. Speaking of mazes, I found a whole bunch of cool ones when I was poking around the Math Magic site hosted by Stetson University. Each month Math Magic poses a math question for readers to work on and then submit their solutions. This month’s question is about packing squares in squares. (Click to see the submissions so far.) At the bottom of the page you can find links to many more cool math sites, but as promised, I’ll share some of the mazes I found. 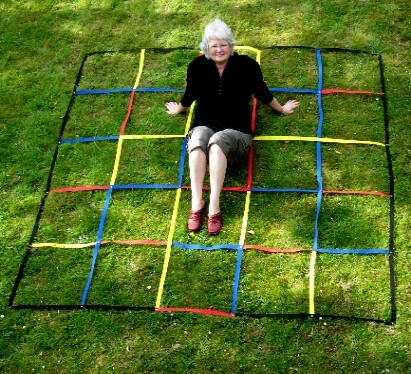 A puzzle designer for over 40 years, here Andrea Gilbert lays across one of her step-over sequence mazes. First there’s Andrea Gilbert’s site, Click Mazes, which has all sorts of online mazes and puzzles. In the picture you can see Andrea laying in one of her step-over sequence mazes. How do you figure they work? Then there’s Logic Mazes, a website of mazes by Robert Abbott. I don’t know much about Robert, but his site caught my eye because it begins with Five Easy Mazes: 1 2 3 4 5, but there are better mazes after that. I really liked the number mazes. Play around, think your way through, and have some fun!